Families still took their children trick-or-treating in lower Manhattan. And costumed New Yorkers flooded the streets for an annual Halloween parade. Just hours after the deadliest terror attack in New York City since 9/11, residents refused to let fear ruin their Halloween plans. Families still took their children trick-or-treating in lower Manhattan not far from the crime scene, where a man drove a truck into a crowd, killing at least eight people. And costumed New Yorkers flooded the streets for the annual Village Halloween Parade less than a mile from where the attack took place. New York Gov. Andrew Cuomo made an appearance at the parade. He told CNN he came "to say you didn't win and you didn't affect us. ... We're living our lives because we're not going to allow the terrorists to win, period." 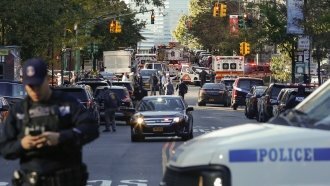 In a statement Wednesday morning, acting Secretary of Homeland Security Elaine Duke said, "As the people of New York got up this morning and began their day as normal, they once again demonstrated to the world that Americans will not be intimidated or coerced by terrorists. We will continue to counter terrorist hate while relentlessly defending our country, our values, and our way of life." The NYPD and FBI are still investigating Tuesday's attack. The suspect is in custody.